This month, EPG introduces valued team member, Rob Rawson, newly appointed operations manager. Rob works directly with clients to implement security plans that are customized to meet their needs, and he also manages the personnel who work with EPG’s clients. Rob is dedicated to doing whatever it takes to exceed client expectations, and he ensures everyone on his team is, too. EPG General Manager Brian Moran is an outstanding leader and a role model to many. A military veteran who has dedicated his life to helping others, Brian ensures that every EPG team member is empowered to be their best, with the highest levels of training, compensation and respect. He is also committed to providing each member of the team with the tools and resources they need to exceed customer expectations. This month, EPG salutes Brian! EPG Security Group, a Minneapolis, Minnesota-based protective services firm, and Target Center, a multi-use arena located in the heart of downtown Minneapolis, recently announced a partnership to ensure VIP guests receive a premium experience in two of its new hospitality spaces: the TCL SixOneTwo Lounge and Lexus Courtside Club. Target Center officially reopened this week after an 18-month $145 million renovation. The project included the creation of several all-new premium spaces including the Chairman’s Club, Lexus Courtside Club, TCL Theater Boxes and Club T.I. Additionally, the premium level has been rebranded; concourse and bowl renovations include new digital signage and scoreboard, seats, sound system and restrooms. Since it opened in 1990, Target Center has strived to provide guests with opportunities to experience a wide range of memorable moments in a safe and secure environment. EPG’s Bergling is a military veteran who has dedicated his career to protecting people and property. Bergling developed a unique approach to protective services for the hospitality industry and event venues that is focused on putting people first. “Our agents are approachable and responsive members of the community that staff and visitors come to know and trust,” Bergling said. Bergling also noted that every EPG team member is empowered to be their best with the highest levels of training, compensation and respect; all are dedicated to doing whatever it takes to exceed expectations of clients and the communities they serve. The EPG team will be serving the TCL SixOneTwo Lounge, a premium space for select season ticket members. The space is located on the arena’s skyway level and provides direct, private access to the 100-level of the arena. EPG will also serve the Lexus Courtside Club, Target Center’s new ultra-premium club space located on First Avenue, with a private entrance and valet, plus members-only access to the court. Launched in 2007 and led by founder/CEO Erik Bergling, Minneapolis-based EPG Security Group provides hospitality industry, special event and uniformed security services for executives, organizations, properties and venues. Licensed in Minnesota, Wisconsin, Florida and D.C., EPG has a network of strategic partners worldwide, allowing the company to serve clients wherever their business takes them. For more information, visit epgsecuritygroup.com. Located in the heart of downtown Minneapolis’ warehouse district, Target Center welcomes over one million guests annually. The arena, owned by the City of Minneapolis and operated by AEG Facilities, is home to the NBA’s Minnesota Timberwolves and 4-time WNBA champions, the Minnesota Lynx. For more information and a list of upcoming events, please visit targetcenter.com. EPG Security Group is dedicated to providing excellent customer service. And every EPG team member is empowered to be their best with the highest levels of training, compensation and respect; all are dedicated to doing whatever it takes to exceed your expectations. This month, EPG introduces valued team member, Mickaela Cisewski, scheduling manager. Leave copies of your passport, credit cards, travelers checks and airline tickets with friends or family. Consider investing in travel insurance. Keep all of your belongings within reach at all times. Remember that security personnel are trained to take your safety serious—do not joke about topics such as terrorism, weapons, explosives or firearms. Check www.tsa.gov for the most up to date information. If your passport is lost or stolen, be sure to call the local police and the consulate; keep a photocopy of your passport with you to make the replacement process easier. In the event of civil unrest, be sure to contact your hotel, the consulate and your airline to check on safety; avoid demonstrations and when available seek shelter in police stations, hotels, restaurants, etc. Avoid carrying large quantities of cash and use traveler’s checks whenever possible as they can be replaced. The safest way to carry your money and belongings is a non-visible money belt; avoid carrying wallets or purses, or wearing jewelry. When transferring money from your money belt to your pockets, do so in a private area such as a bathroom or hotel room. In order to avoid standing out in a crowd, take the time to research local dress and adjust accordingly. EPG delivers exceptional customized protective services from trusted professionals who go above and beyond to ensure the security and safety of the people and assets that matter most to you. Every EPG team member is empowered to be their best with the highest levels of training, compensation and respect; all are dedicated to doing whatever it takes to exceed your expectations. This month, EPG introduces valued team member, Kadie Gutierrez, operations manager. The Minnesota State Fair is one of the largest in the country, with a whopping 1.8 million in attendance over 12 days last year. That means that on any given day visitors are rubbing (sticky) elbows at the “Great Minnesota Get-Together” with about 150,000 other people. The good news is that the Minnesota State Fair takes its security measures seriously. In fact, last year security was beefed up at the gates, and bag searches and video surveillance were added. But visitors are ultimately responsible for protecting themselves, their families and their valuables. Identify the exits. Sometimes the best way to prevent injury (or worse) is to leave before things get out of control. If you do happen to get caught up in a chaotic situation, you’ll be thankful you know exactly where to go. Dress appropriately. Baggy clothes, untied shoelaces and sandals can get caught on equipment or snagged on amusement park rides. While looking good and keeping cool are important, also give some consideration to safety as you choose your outfit for the fair. Pay attention to structures. The fair is full of temporary structures like vendor booths, shelters and staging. Keep an eye on what you are leaning on or walking under to avoid unintentionally collapsing a tent, tripping on a cord, etc. Avoid the crowd. Plan your visit early in the morning or later in the evening to avoid crowds. If you happen to be there during peak times, avoid large groups by walking around them rather than trying to push your way through. If you are stuck in a crowd, walk sideways or diagonally to get out. Protect your valuables. Limit the valuables you bring to the fair to your ID, cash, one credit card and a cell phone (fully charged with ringer and vibrate on), and keep them in your front pocket if possible. Choose a purse or crossbody bag with a zipper or clasp closure. Keep an eye on the kids. Write your phone number on your child’s arm with a Sharpie or put it in his or her pocket. Make sure kids know whom they should talk to if they are lost. Pick a place to meet up if you get separated and make sure everyone knows where it is. Consider dressing similarly or in bright colors, and use your cell phone to take a photo of the kids before you leave the house so you know exactly what they look like that day. Ask for help. The Minnesota State Fair engages hundreds of security professionals to ensure crowd safety. If you need help, don’t be afraid to ask—that is what they are there for. Based in Minneapolis with networks extending worldwide, EPG Security Group is independently owned and is the third largest veteran-owned business in Minnesota. Clients range from large public festivals to small private events, from restaurants to hospitals, from entertainers and sports celebrities to politicians and private individuals. For more information, visit EPGSecurityGroup.com. Away from it all, out in the open air… the rolling green pastures… the blue skies above. It may be the last place on earth you’d be thinking about security. But securing your farm or ranch against everyday crime requires a plan. If you haven’t given any thought to a plan, we have a security checklist that will point you in the right direction and help you start to develop one. 1. Do you have insurance coverage that protects against theft, vandalism, pesticide spills and/or terrorist attacks on your farm? Ask your insurance agent to walk your farm with you, assess your risks and review your coverage. 2. Is your 911 emergency address posted and easily visible on your mailbox or a post on the county or parish road? Identify your property for emergency personnel with three-inch reflective numbers on the mailbox, post or other location. 3. Do you have a permanently installed, well-hidden mailbox or lock box that serves as an emergency information box for emergency personnel? Do they know where it’s located? Items in the information box should include an up-to-date farm map, a list of emergency contact persons and their phone numbers, locations and amounts of hazardous chemicals safety data sheets, and a list of the major contents of each building. Have the location of the information box entered into the computer database at your 911 dispatch center, and personally inform your local fire and police chiefs or sheriff. 4. Do you have a farm map with the contents of each building listed? The map should include the contents at each location and identify vulnerable items such as chemicals, fuel, vehicles and livestock that someone might want to contaminate, steal or damage. 5. Are pesticides and farm chemicals stored in one location? Are they secure? Do you have an inventory? All chemicals should be stored in a locked and weatherproof building and as recommended by the manufacturer’s label instructions. 6. Have you approached your local fire department about visiting your farm for a safety and security check? You should have working fire extinguishers in plain sight in numerous places. Employees should know where they are and how to use them. You should have working fire alarms in place. Replace batteries every six months. An on-site inspection by local fire department personnel will identify areas of concern for you to address. Show them the locations of water mains, electricity control boxes, fuel and chemical supplies, your emergency information box, and livestock holding areas. 7. Have you asked a professional law enforcement officer to help identify security issues? Remove wood piles, debris piles, brush and other potential hiding places near these buildings. 8. Do you have appropriate areas locked or gated? Are the locks, fences and gates in good condition? Do you regularly check for tampering? Do you have control of keys? 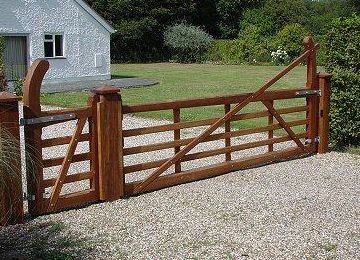 Install and maintain gates and locks, and use them whenever possible. Never leave keys in vehicles or equipment. Tag and code keys. Keep them in a secure place. Keep the number of key copies to a minimum; sign them out when needed. Recover keys and change locks when employees are fired or leave. 9. Do you have lighting in the right places? Install adequate lighting to permit work and deter theft or other crimes. Light critical areas such as fuel tanks, grain bins and chemical storage areas. Place video cameras, motion detection lights or other electronic monitoring devices in strategic locations. Use watchdogs in appropriate locations. 10. Do you have a prioritized list of contact names and numbers in case you are away from the farm or incapacitated during an emergency? Do your family members and employees have the list? Place an emergency contact list next to each phone. Include fire, police, ambulance, veterinarian and poison control numbers. Pre-program the emergency numbers into cell phones. 11. Have you taken appropriate biosecurity measures to protect your animals? Do you have an inventory of your animals? Can you identify them? All your animals should be identified. They should also be inventoried frequently. Animals should be monitored frequently for signs of illness or harm. Maintain complete and accurate animal health records. House sick animals in an isolation area away from other animals. Feed and treat them after healthy animal chores are completed. Change and disinfect clothes and footwear after working with sick animals. Implement and maintain effective nutrition, vaccination and parasite control programs. Quarantine new animals for at least 30 days before introducing them to the herd. Store feed well away from sources of contamination such as fuel and chemicals. Protect feed from contamination by cat, bird and vermin feces. Don’t feed mammalian-origin protein to ruminants. Keep all feed records for at least five years. Use separate equipment for feed and waste handling. Locate watering areas away from roads and other areas easily accessible by passersby. Necropsy and properly dispose of dead animals. Control personnel and visitor entries. Require visitors to sign in and provide their addresses. To control disease, restrict international visitors’ access to certain areas of the farm. Provide coveralls, plastic boot covers or boots for visitors. Use disinfectant on boots, tires and equipment. If you borrow equipment, disinfect it before and after use. Don’t share fences with neighbors. Maintain your fences and barns. 12. Have you taken appropriate biosecurity measures to protect your crops and stored grain? Conduct routine checks on cropland to monitor for evidence of unusual disease or damage. Control personnel and visitor entry. Require visitors to sign in and provide their addresses. To control disease, restrict international visitors access to certain areas of the farm. 13. Do your family members and employees know what to look for and what to report to the authorities to ensure farm security? Walk around buildings and along fence lines to look for signs of trespassing and unusual activity. Be aware of unfamiliar vehicles. Family members and employees should report suspicious people, vehicles or activities to you. Report suspicious people, vehicles and activities to local law enforcement officials. 14. Are your employees trained to handle pesticides and operate equipment? Provide opportunities for your employees to take appropriate training and certification courses such as pesticide handler training and certification. 15. What security measures do you take when hiring new employees? Perform reference and background checks on potential employees. Train new employees on security and biosecurity protocols and be available to answer questions they might have. 16. Do you have a well-stocked first aid kit and does everyone know how to use it? Is your first aid/CPR certification up to date? Place up-to-date first aid kits and water flush bottles in numerous places on your property. Everyone should know where the kits are. Provide opportunities for employees to take first aid and CPR training. Be sure everyone knows who is certified. Update supplies as they are used and check expiration dates on medicines and topical ointments. 17. Do employees know or have access to common contact information? List routine business contacts and information in a convenient location so others can find it if you or your manager is absent. Maintain an up-to-date phone and address list of your employees. 18. Are your farm records complete, up-to-date and secure? Are your computers properly maintained and secured? Do you have current computer virus updates? Do you back up data frequently and store it on a secure site away from the farm or on cloud-based storage? Ensure your records are complete and accurate. Maintain a schedule for updating your farm computers with current anti-virus software. 19. Do your family members and employees know what to do in case of an emergency? Conduct regular simulations of emergencies. Involve all family members and employees. Following a simulation, discuss what was effective and what could be improved. The holiday season is filled with happiness and celebration, but it can also be a time of danger. Unfortunately, there are criminals who use the holidays to target victims who may be distracted by the busy season. Don’t let your holidays be ruined by becoming the victim of a crime. Here are some tips to stay safe. The holiday season is a great time to get to know your neighbors who live next door, across the street and over the back fence Neighbors watching out for neighbors help keep an eye out for suspicious activity and make communities safer. Make sure to always lock your vehicle and hid your valuables in the trunk or locked compartment. Make sure to walk in well-lit areas and carry your keys in your hand. Whenever in crowded places stay alert to your surroundings. Keep a look out for anyone that looks suspicious and make sure to never leave your belongings unattended. Inform someone who’s trustworthy where you will be and when you might be expected back to your residence. Ask a neighbor or other dependable persons to watch your house and retrieve your newspapers and mail if possible. Unfortunately, businesses can sometimes experience some type of workplace violence, threat, or upset employee termination from time to time. You can help keep the workplace safe by implementing policies and procedures for dealing with said situations. EPG can help with assisting in workplace violence, threats, and employee discharge. We can help mitigate risk and ensure a safe working environment by offering to consult or by providing additional security resources, such as surveillance or security personal. • What is happening in his/her own life that has prompted this? • Does he/she feel he has been wronged in some way? • How does the offender cope with disappointment, loss or failure? • How does the offender interact with coworkers? • Does he/she feel he is being treated fairly by the company? • Does he/she have problems with supervisors or management? • Is he/she experiencing personal problems such as divorce, death in the family, health problems, or other personal losses or issues? • Is he/she experiencing financial problems, high personal debt, or bankruptcy? • Is there evidence of substance abuse or mental illness/depression? • Has the he/she shown an interest in violence through movies, games, books, or magazines? • Is he/she preoccupied with violent themes; interested in publicized violent events; or fascinated with and/or recently acquired weapons? • Has the offender identified a specific target and communicated with others his/her thoughts or plans for violence? • Is he/she obsessed with others or engaged in any stalking or surveillance activity? • Has the offender spoken of homicide or suicide? • Does the offender have a plan for what he/she would do? Planning on heading out tonight? We have personal safety tips to keep safe this Halloween night. 1) Plan ahead! Watch or read up on local news and weather for where you’re going. Check the events website for important information before you go. 2) Be mindful! Plan a safe way of carrying your valuables (wallet,money, credit/debit cards, purse, cell phone). This goes for the car too, make sure you’re not leaving valuables in plain sight or the car unlocked. 3) Be aware of your surroundings! Pay attention to where the exits are. When you get somewhere new make sure you’re constantly familiarizing yourself with the area. 4) Plan a meeting point! If you’re going with a group, plan a meeting point in case you become separated. Plan times to check in on each other and follow up when someone doesn’t. 5) Is it going to be a long day? Write down important numbers, so when your phone dies, you can still get in contact with your group if separated. 6) Avoid crowds where overly intoxicated people gather. If someone’s had too much to drink don’t be afraid to notify a Security or Police Officer. Keeping these precautions in mind will help ensure you will stay safe this Halloween season! Recently, national news networks are covering more school violence stories than ever before due to incidents of high-profile school gun violence and bullying. In order to protect our children from harm, school security guards are becoming more and more of a necessity. As children enter their teens, behavior problems seem to either subside or intensify and schools often become a dumping ground for undiagnosed and untreated students. Having someone watching the school grounds can help prevent crimes because it means that someone is there to watch the initial stages of the crime before people get hurt or property damage is done. Security guards can help protect schools from attacks of physical, emotional or sexual abuse by working to prevent these acts internally. Sometimes the school isn’t the safety issue. Having security guards can protect against trespassing that could prevent strangers bringing weapons into the school, attempted kidnapping or stealing of expensive school property. Security guards can get involved when they see kids getting bullied at school. They can help bring these instances to parents in order for family members to handle the situation at home. When it comes to protecting students and administrators in the schools, EPG Security Group’s security officers are at the top of their class. Our commitment to creating the safest possible environment has earned us a reputation for excellence and long-term client relationships. If you have questions or would like to learn more, call us and schedule a FREE school security assessment today at 612.205.6653. Security assessments (sometimes called security audits or evaluations) provide findings and recommendations individualized to your district/school, many at low-cost or no-cost to implement! Weddings can present a unique security opportunity. Although mostly a happy occasion, we’ve all heard the stories of some unruly relative, pesky wedding crasher or inebriated guest spoiling it for everyone especially the bride. Security might be the last thing on your lists of to-dos when planning for your big day, but years of experience working special events have taught us that this, in fact, is an aspect of your big day you won’t want to be without. Whether you are planning a large get-together or a small intimate wedding you will want to enjoy every minute of it. All it takes is one unwelcomed guest or alcohol-fuelled brawl to ruin the day which so much effort was put into. When our security guards are working on-site, they are capable of providing a variety of important services. Why should you consider hiring security to protect your big day? Many venues require security guards, particularly if alcohol is served at the reception. People who work at wedding venues understand the need for security, and requiring it means that they are interested in helping you have a wedding without incident. We will help guard and watch over the gift table and money box as well as keep an eye on guests’ purses and personal items when they get up to dance and enjoy themselves. There are people who crash weddings with the intent to steal or simply get free food and drinks. We can help check guests in at your reception. EPG Security Group works with some of the most well-known wedding venues in the upper Midwest. Our clients understand that their clients demand well groomed and customer service driven professionals. EPG delivers on their expectations by custom fitting each security officer to each individual event. This August we had the pleasure to work with Hormel Foods, home of SPAM, during their 125th Anniversary Celebration! Nearly 15,000 people filled Austin, Minnesota to celebrate a great company and rock out to The Band Perry. We thought this would be a great time to talk about protective measures for outdoor gatherings. Outdoor gatherings are always a hit, but can offer some challenges when it comes to security measures. 1) At many of these events, there may be no protected perimeter. 2) Large outdoor public gatherings involve temporary structures, such as tents and booths. all aspects of security must be planned and formulated for each individual gathering. ordinances, and permitting process are different. At EPG we have experienced management, ample and competent supervision and the utilization of smart technologies that are critical to the success of events like this. Technology is leveraged to maintain the highest standards. A voice broadcast and text messaging service are utilized for rapid communication to an unlimited number of security personnel at one time and smart phones and GPS mapping are utilized for efficient communications with clients. At the end of July, EPG Security Group headed to Cleveland, Ohio to provide protective services for senior elected officials and special events surrounding the Republican National Convention. The RNC was a success and we are looking forward to working on the inauguration in 2017 in DC. With the police massacre in Dallas preceding the event, there was more security than originally planned with threats of increased protests around the country. Fortunately, the event went smoothly. We took a total of 7 agents including our owner Erik Bergling from July 15th-22nd. One of the highlights of the trip was getting to know the crew from CNN. We were able to give them a couple of our stocking caps and they sent us this quirky little GIF. To watch visit our Facebook page! EPG Security Group headed to Cleveland, Ohio this week to provide protective services for senior elected officials and special events surrounding the Republican National Convention. More to come from this honorable event. With elections currently taking place we thought this would be a good time to address political event security. Political events are different than other events due to higher threat levels mostly coming from opposing organizations. It is important that standards, procedures, and actions are taken to overcome challenges such as personal safety of the candidate and party leaders, obsessive fans, intrusive media, and competitive intelligence between parties. EPG understands the complexities of this type of security and with our backgrounds in law enforcement and through our partner networks, we can support your requirements for special events and static/roving guard operations. We provide the consulting and protective services necessary to help ensure the candidate and party are safe and secure. We create your security plans, coordinate with security and law enforcement providers, and effectively manage all security requirements of your event. Coming out of the Orlando massacre where 49 people were killed and 53 were injured, nightclub security is a rising topic and many establishments are adding in additional security measures. So what measures should they be taking? -Implementing the use of wands and metal detectors is a great way to have a hard check past the point of entering the club. Having patrons walk through metal detectors is a quick way to alert security personnel of dangerous objects such as knives or weapons. -Increasing communication with law enforcement is extremely important as to alert them of any suspicious or criminal behavior. Also, communicating large events or celebrity appearances can be helpful so that they can be aware and prepared for larger groups of people. -Adding additional security. It is important that when providing securing for large venues you have a company with a high level of expertise, experience, and trust. EPG Security Group’s is comprised of former military personnel and experienced security professionals in order to provide these things. If you have any questions or concerns about the safety of your establishment, EPG is always here to help. Feel free to reach out and talk with one of our experienced team members. EPG Security had the honor of participating in 21st Art-A-Whirl art crawl! The event is presented by the Northeast Minneapolis Arts Association (NEMAA) and takes place annually throughout Northeast Minneapolis. The event is free and opened to the public and a known Minneapolis kick off to summer staple. Tens of thousands of visitors came out to support the more than 500 artists who exhibited their work. We were located at Bauhaus brewery where artists of all kinds came together with a wonderful line up of bands for one of the largest events in the country of this kind. EPG was honored to provide our services making sure everybody attending the event had a fun, safe and memorable time. With last evening’s events, we thought it would be an important time to go over travel safety and airport security tips when traveling abroad. Here are some tips to help keep yourself and those around you safe. -Keep all of your belongings in reach at all times. -Do not accept packages from strangers. -Remember that security personnel are trained to take your safety serious so do not joke about topics such as terrorism, weapons, explosives or firearms. -Check www.tsa.gov for the most up to date information. -Lost or stolen passports – Make sure to pack a photocopy of your passport in order to improve the replacement process. If you lose a passport make sure to call the local police and the consulate. -Avoid demonstrations and acts of civil unrest and when available look for shelter in police stations, hotels, restaurants, etc. -Avoid carrying large quantities of cash and use traveler’s checks if available as they can be replaced. -The safest way to carry your money and belongings is a non-visible money belt. Avoid wearing jewelry, wallets, or purses. -When transferring money from your money belt to your pockets do so in a private area such as a bathroom or hotel room. -In order to blend in with the crowd take the time to research local dress to avoid standing out. -Before traveling make sure to leave copies of your credit cards, passport, travelers checks and airline tickets with friends or family. -A reminder that your credit card number is on your airline ticket. Make sure you keep this separate location than your passport.